UTV WOLFPACK GLEN HELEN RND 4 2013 from Merrell Media on Vimeo. Running a wounded car from an earlier qualifying incident, left Wolfpack Teammate, Bryan Carr’s Polaris down from peak performance. He raced hard and minimized mistakes where others faltered. Bryan narrowly avoided a UTV flipping directly in front of him on the whoop section. Carr would go onto capture the 4th place finish and is defending his #713 season point’s position in the top 5. Jordan Cochrum finished in a competitive top 10 position. After a really rough qualifying session and issues with the transponder, Jordan would start towards the back of the pack. In a field with 20 entries, it is a difficult task with a lot of quality competition to race against. Cochrum worked the #702 Rockstar Polaris back up to 8th place. Jordan was hoping for a better finish however he learned a lot from the night and was happy to walk away with respectable top 10. For all the Round 4 Glen Helen race results, qualifying times, and season championship points check out www.MyLaps.com. For more team & series info visit www.UTVWolfpack.com and “Like” UTV Wolfpack on Facebook . 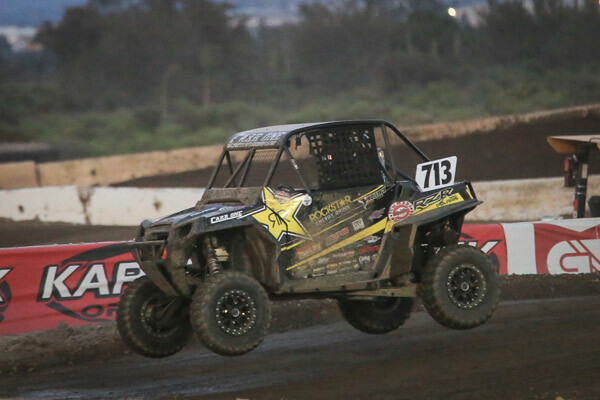 The Rockstar Energy / Polaris UTV Wolf Pack continues to move forward in the Lucas Oil Off Road Regional Series Championship. Be sure to mark September 7th, 2013 on your calendars for Round 5 at Lake Elsinore CA. The team would like to thank all of their sponsors and supporters and are looking forward to the next race weekend. Also would like to thank the Lucas Oil Regional Off Road Racing Series Staff and Safety Crew for putting on such an awesome event. Eclipse Recreational RV’s, Summers Bros Racing, Loctite, Liquid Graphics, Merrell Media, Coast Motoring, Replay Cameras, Rockwell Watches, Approved Memory, Proline Wraps, Sound Stream Audio.